ILS was founded by its current CEO, Dr. Anton J. Nagy in 2005 who’s rather unconventional original investors were his Grandparents; WWII refugees from Croatia from whom he inherited 50.000€. ILS had its humble beginnings in a shared working space started by Eberhard Mutscheller called the Gründergallerie, which was a neighborhood initiative to encourage re-investment in a neighborhood, which was at the time considered a high-risk area and has since become one of the most sought-after gentrified neighborhoods in Berlin. 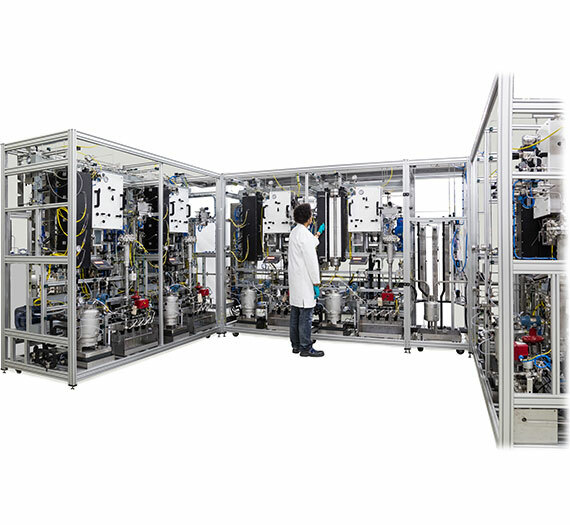 In its first years, ILS assembled its units with a partner company in Switzerland and had process-automation solutions made by a process-control partner in the Netherlands. Over time as ILS organically grew to it’s near now 34-staff members we have moved our complete construction and assembly to Berlin and are proud to have established our own process-control and automation group in Berlin this year. The establishment of our combined contract R&D testing laboratory and assembly workshop in December 2016 was a major milestone and one which helps us provide a service package, which very few other companies in the world can provide. ILS is proud of the fact that our growth has been entirely attributed to client-purchases and not government-subsidized projects or inputs of cash from venture capital. We have complete ownership of our future and focus on healthy, organic long-term growth with the satisfaction of both our clients and employees as our main priorities. Dr. Nagy was born in 1970 and is originally from the Chicagoland area. He did his BS at the IIT in Chicago and MS in Chemical Engineering at the Worcester Polytechnical Institute where he had his first exposure to catalysis doing acreolein catalyst synthesis and testing in the group of Prof. William Moser. He moved on to work as an intern at the Shell laboratories in Amsterdam and subsequently did his PhD work in heterogeneous catalysts at the Max-Planck Institute in Berlin in the late 90’s. Following his PhD he moved to Bayer where he helped run the group for microreaction technology and MAP-Miniaturization/Automation/Parallelization. The wider range of chemistries he was exposed to at Bayer proved extremely valuable at his subsequent job at Avantium in Amsterdam. Here he had the pleasure of participating in a young, European startup company nearly from its inception. Ultimately, it was both his love of catalysis and the city of Berlin that ultimately resulted in the decision to found a catalyst testing service provider in Berlin with the unique capabilities, that ILS has. If it is important to you to feel like your day-to-day contribution matters, then ILS is a company for you. From the intern to the owner, everyone at ILS works collaboratively to help ensure that we provide the highest-quality innovative R&D workflow solutions to our clients. We provide competitive salaries in one of Europe’s most dynamic and culturally-rich cities. ILS staff are provided every year with opportunities to attend both formal and informal training in order to hone existing or develop completely new skills. Finding the balance between ILS the ever-changing needs of a rapidly-growing company like ILS and our employees personal growth targets is a continuous challenge we work to perfect. We consider a healthy work-life balance essential and overtime is compensated by providing additional time-off to insure that our team members can stay fresh, alert and motivated. Travel abroad is limited to maximum 2-3 weeks at a time.